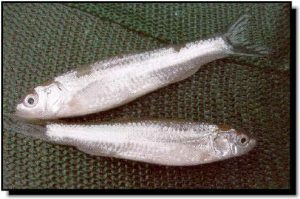 Comments: The Western silvery minnow appears strawcolored with yellowish-white or dull silvery sides. It is a big river minnow adapted to turbid water. It can reach 6 inches in length and often forms schools of 50 to 100 individuals along the silty bottom of deep, quiet water in the Missouri River. It was formerly common behind structures like wing dams and revetments. It resembles the plains minnow but possesses larger eyes and scales. It has declined in number and hasn’t been found in the Kansas River for several decades. The Western silvery minnow may no longer have a reproductively viable population in Kansas. In all probability, too many manmade alterations to the hydrology of the Missouri and lower Kansas rivers have occurred that were detrimental to the Western silvery minnow.